The less well-known verse of the ubiquitous Christmas song give a clue to its origins. Irving Berlin wrote White Christmas in the summer of 1940 in sunny California (another heatwave in 1949 also inspired Sleigh Ride. According to legend he told his secretary that he it was the 'greatest song ever' but there seems to have been no hurry to get it to the public. 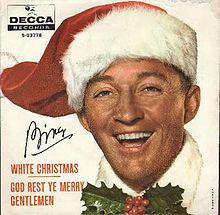 It finally surfaced on Christmas Day, 1941 when it was performed publicly by Bing Crosby for the first time in a radio broadcast. Again this received little attention. The song was on a soundtrack album released in July 1942. It was not the first single released from this LP and its initial popularity came via requests to armed forces radio stations. When it was finally released at the end of October it rose rapidly to the top of the charts, where it stayed until the New Year. Over the years it became the best-selling single of all time. What caused this dramatic rise in popularity? Many have noted that the attack on Pearl Harbour and America's subsequent entry into World War Two was the catalyst. The song's yearning for home struck a profound chord with soldiers, sailors and airmen stationed in far-off lands. Berlin celebrated Christmas with his wife and their four daughters when the girls were young, but he and Ellin were always sad on that day. The tragedy of Berlin/McKay's otherwise happy marriage was the death of their only boy, Irving Berlin, Jr., on Christmas day, 1928. He was just three weeks old. Fascinating audio on the origins of the song, including interview with Irving Berlin's daughter here. christmas english language irving berlin Where does this word come from? white christmas Why do we say ...? Labels: christmas english language irving berlin Where does this word come from? white christmas Why do we say ...?